Jesus for Judaism - What Would Jesus Really Do? Since Jesus was Jewish, and his original followers were Jewish, modern day followers of Jesus might want to consider embracing Judaism by worshipping God in the context of Jewish faith, life, and community. This could be done through conversion to Judaism (as defended below) or simply through support of Judaism as described by organizations such as Friends of Judaism. Historically, the uninformed or misinformed Christian response to Judaism has been somewhat indifferent and at times hostile. This is incomprehensible considering that Jesus was a practicing Jew. Yet, this 2000 year old paradox continues today. This site draws upon Christian concepts, scriptures, and writings to explore how Christians and others might logically support, defend, promote, and embrace Judaism and Jewish Community. At first glance, the title "Jesus for Judaism" appears to be an oxymoron - a contradiction of terms - like "Jews for Jesus." However, as you will read here, there are many reasons for Christians to be supportive of Judaism and Jewish Community. We are not talking about "Messianic Judaism" (a combination of Judaism and Christianity) but traditional forms of Judaism -- the authentic faith of Jesus. The purpose of Jesus for Judaism is to support, defend, and promote Judaism and Jewish Community in local communities, in Israel, and around the world. We felt it would be helpful to develop this site as a resource to counteract and diffuse the misinformation and misconceptions that exists today regarding Judaism. Instead of confronting anti-Jewish propaganda we will simply present Biblical, historical, and modern day observations about Judaism from a Christian perspective. We hope you find this information helpful. If you are Jewish, we hope the writings here will encourage you in your faith. If you are a Christian, we hope the writings here will give you new insights into the Jewish faith of Jesus and help you develop a greater appreciation for Judaism and Jewish Community. Throughout the past 2000 years, millions of people around the world have believed that God sent Jesus to the world as an example of how to live. Since the example he lived was life as an observant Jew, shouldn't we be all the more serious about pursuing Jewish life? Here are some points to consider. The New Testament takes place in Israel, a predominantly Jewish land. The New Testament is a Jewish Book - written by, to, for, and about Jews and converts to Judaism (and also a minority of people who were followers of Jesus without having converted to Judaism). It is constantly making explicit and implicit references to the Old Testament. Not only was Jesus Jewish by heritage, he was also an observant Jew, as was evidenced by his Synagogue attendance, observation of the Biblical Jewish feasts, and frequent quoting of Jewish scripture. Regarding The Law (the beneficial guidelines of Jewish life set forth in the Old Testament), Jesus said: "I tell you the truth, until heaven and earth disappear, not the smallest letter, not the least stroke of a pen, will by any means disappear from the Law until everything is accomplished." [Matthew 5:18 NIV] If you are reading this page, then it is likely that heaven and earth have not disappeared, and therefore, according to Jesus, Judaism is still of value to us today. Referring to Jesus, the New Testament describes "The Word became flesh..." [John 1:14 NIV] If this is so, then Jesus is the living, breathing, walking, Tenakh (Old Testament). When he says, "I am the way and the truth and the life. No one comes to the Father except through me." [John 14:6 NIV] He is speaking prophetically as the Tenakh (Old Testament) and referring to the Jewish way of life that he was living. This is further clarified in these statements: "My teaching is not my own. It comes from him who sent me." [John 7:16 NIV] "He who does not love me will not obey my teaching. These words you hear are not my own; they belong to the Father who sent me." [John 14:24 NIV] His teachings were not the teachings of "Jesus," but of God, or rather God's Word, the Bible. This is why he was constantly pointing people to God rather than to himself. Some followers of Jesus proposed this guideline: "The Gentiles must be circumcised and required to obey the law of Moses." [Acts 15:5 NIV] However, this suggestion was rejected in favor of less stringent requirements. Regarding Judaism and the Jewish people, the Apostle Paul states, "a man is a Jew if he is one inwardly; and circumcision is circumcision of the heart, by the Spirit, not by the written code. (See Deuteronomy 10:16, 30:6, and Jeremiah 4:4) Such a man's praise is not from men, but from God. What advantage, then, is there in being a Jew, or what value is there in circumcision? Much in every way! First of all, they have been entrusted with the very words of God." [Romans 2:29-3:2 NIV] "Theirs is the adoption as sons; theirs the divine glory, the covenants, the receiving of the law, the temple worship and the promises. Theirs are the patriarchs, and from them is traced the human ancestry of Christ, who is over all, God blessed forever. Amen." Most people believe that 'the Jews' rejected Jesus. The fact is that the Jews were the only people on the entire earth who accepted Jesus. Obviously not everyone in the Jewish community accepted Jesus, but his followers were almost exclusively Jewish. So he was both accepted and rejected by the Jewish people of his day. In comparison, there are only a few rare occasions during his life when he was accepted by non-Jews. Initially, the Jewish followers of Jesus didn't imagine that anyone who wasn't Jewish would be interested in Jesus' message. Only after a series of miraculous events (see Acts 10-11) did the Jewish followers of Jesus begin to evangelize the rest of the world in a movement that resulted in millions of people following the teachings of their Jewish Rabbi. It's hard to believe, yet it's true. The "Gospel of Jesus Christ" is being preached in Jewish Synagogues around the world on a regular basis. In fact, the "Gospel of Jesus Christ" is being preached more frequently in Jewish Synagogues today than in Christian Churches. "How can this be?" You ask. Well, the "Gospel of Jesus Christ" is different than the "Gospel about Jesus Christ." The "Gospel of Jesus Christ" refers to the gospel or message that Jesus preached. The message that Jesus preached was a message (or gospel) about the Kingdom of God. Remember all of those Kingdom of God parables and all that talk about the coming Kingdom of God. In "the Lord's prayer" you'll recall the reference to "thy Kingdom come." In Synagogues today, the "Kingdom of God" is a frequent topic of readings and prayers. One might protest saying, "How can they do that!? Isn't that copyright infringement!?" Well, you'll recall that Jesus is Jewish. So, Judaism isn't copying Jesus' teachings, Jesus' teachings reflect Jewish faith and thought. From what we know, he quoted exclusively from the Jewish scriptures, even though there would have been other texts and books of wisdom available in his day. He fervently and enthusiastically preached and promoted a "living," vibrant, and dynamic form of spiritual Judaism. Perhaps you've seen bracelets and other items that display the WWJD logo, posing the question, "What Would Jesus Do?" CNN recently aired a special segment asking the question, "What Would Jesus Really Do?" If we were to closely follow the example of Jesus, we would encourage people of every background to pursue Jewish faith and develop a connectedness with the God of Abraham, Isaac, and Jacob. We would also observe Jewish feasts, festivals, and customs. It's an interesting paradox that those who don't claim to follow Jesus (today's Jews) reflect his life and message in some ways more closely than those who claim to follow Jesus (today's Christians). This is in no way a criticism of the Christian faith, simply an observation. No doubt there is more yet to unfold in human history regarding these things. The WWJD (What Would Jesus Do) logo has been an amazingly popular phenomenon resulting in the WWJD letters being placed on clothing, bumper stickers, and numerous other items. If you are one who seeks to more authentically follow and reflect the life and teachings of Jesus, consider the following evaluation and comparison of Jesus, Judaism, and Christianity. It's interesting to consider what lifestyle and faith community is most in line with the life and faith of Jesus. * We know that Jesus was circumcised eight days after his birth and later Consecrated or dedicated as prescribed by the Old Testament (Exodus 13:2, 12), yet it is believed that the present day custom of the Bar/Bat Mitzvah had not yet developed - if it had been, it is believed he would have celebrated it. In the book of Acts we read about an Ethiopian man who was reading Isaiah 53. He was reading the scripture that says: "He was oppressed and afflicted, yet he did not open his mouth; he was led like a lamb to the slaughter, and as a sheep before her shearers is silent, so he did not open his mouth." (Isaiah 53:7 NIV) Then the Ethiopian man asked Philip, who had joined him, "Tell me, please, who is the prophet talking about, himself or someone else?" (Acts 8:34) This is a very important distinction that most people would not even think to ask. The Apostle Paul was very careful to distinguish between the word of God and his own thoughts. Here is an example of this: "To the rest I say this (I, not the Lord): If any brother has a wife who is not a believer and she is willing to live with him, he must not divorce her." [1 Corinthians 7:12 NIV] Elsewhere Paul says, "To the married I give this command (not I, but the Lord): A wife must not separate from her husband." [1 Corinthians 7:10 NIV] Paul makes the important distinction between what he feels are the word and teachings of God and his own words and teachings. It is in this same way that Jesus says, "My teaching is not my own" in John 7:16. The statement "I am the Lord" occurs over 150 times in the Bible. At times it is a voice from heaven, the actual voice of God, but more frequently this statement is found in the written words of various Old Testament prophets. If someone were to interpret that statement to mean that the prophet was actually God in the flesh, it would not be a correct interpretation. One would be tempted to worship that person as God, rather than to live like that person (following their example) as a worshipper of God. Faith could be described as "the ability to accept an event or belief without having a significant body of factual, scientific, and statistical evidence." By faith, a person can believe that something happened in the past or will happen in the future. Some people believe that "Jesus is the Messiah" even though Jesus described the coming of the Messiah as a future event (The day of the Lord, or the coming of the Son of Man). Someone who makes such a statement and holds to such a belief is relying partly on facts (Jesus did fulfill many Messianic scriptures) and partly on faith (a belief that Jesus will return as the Messiah on the day of the Lord). It is important to make this distinction. If we are to conclude that Jesus was only a first century Rabbi, then, like the Jesus Seminar scholars, we would conclude that many of the unusual statements attributed to him must have been fabricated. Yet, the words of the prophets are not considered fabricated even though they challenged the existing paradigms. The words of Jesus should not be rejected as fabricated just because they challenge us or the religious establishment in his day. If we conclude, "A Jewish Rabbi would never say that!" we may very well be tossing a prophetic word of God on the editing room floor. Why should the words of Jesus be rejected when the words of other prophets and religious leaders are accepted as their own? Rather than narrowing our scope, we should broaden our view. He is the Son of David, the natural descendent of King David, thus the natural son of Joseph. "The crowds that went ahead of him and those that followed shouted, "Hosanna to the Son of David!" "Blessed is he who comes in the name of the Lord!" "Hosanna in the highest!" [Matthew 21:9 NIV] He cannot be a natural descendent of David, a Messianic requirement, if he is not the natural son of Joseph. The people didn't shout, "Hosanna to the Step Son of David." According to the above scriptures, Jesus is simultaneously: a first century Jewish Rabbi, the Son of David (the natural son of Joseph), the Son of God (born of the Virgin Mary), the Messiah, the Christ, the Son of Man, the Lord, Bread From Heaven, the Lamb of God, the living Torah, and God on earth (Immanuel - God with us). How can this be? It's more likely that he was an ambassador and representative of them all. Whether we accept all of the above or only a few of the claims about Jesus, regardless of who we claim Jesus is, one thing is certain: everything he ever did or said was 100% Jewish! It doesn't matter how vehemently we present the more spectacular claims about Jesus, the life of Jesus is a life that testifies to the nature of Judaism. Was Jesus God? If Jesus was God, as some claim, then God is Jewish! If God is Jewish, shouldn't we convert to God's religion? The movie "Oh God" with George Burns is a humorous look at what might happen if God were to appear on earth as a man. Yet, it seems unlikely that Jesus was God disguised as a man considering this statement, "Why do you call me good? . . . No one is good - except God alone." [Mark 10:18, Luke 18:19 NIV] A further complication of viewing Jesus as a sort of George Burns "God on Earth" character is that the New Testament clearly describes Jesus as seated at the right hand of God. (Colossians 3:1) Why would God sit next to Himself? It is very interesting to note, however, that when Jesus died, it is reported that the Temple curtain was torn from top to bottom. It is a Jewish custom to tear a garment when a family member or loved one has died. Is it possible that God tore the Temple Curtain (like a garment) as an expression of grief? Why would God express grief in a Jewish manner? Perhaps God is Jewish! One might rightly ask, "What form of Judaism should a follower of Jesus pursue?" In the times of Jesus, there were a variety of Jewish sects such as Pharisees, Sadducees, Essenes, and Zealots. The life and teachings of Jesus were consistent with some of the theological elements found in each of these four sects. He was a legalist (even taking the laws of Moses a step further), yet he taught tolerance, compassion, grace, and mercy (consider the story of the prostitute, John 8:1-11). The life and teachings of Jesus are reflected in various ways among present day expressions of Jewish faith (Orthodox, Conservative, and Reform). Orthodox Judaism continues to preserve the more literal interpretation of scripture reflected in the teachings of Jesus. Also found in Orthodox Judaism is the observance of various festivals and recognition of the mystical side of Judaism. Within Conservative Judaism, an individual is free to pursue more legalistic forms of Judaism and adhere to disciplined religious and spiritual practices, however, they are not required to, nor are people shunned or stoned for not being religious enough (a concern that is reflected in the teachings and life of Jesus). This dualism is rarely found in today's religions. Most religions today are either conservative or liberal. Reform Judaism seems to have room for both conservative and liberal thought. In reform Judaism the role of women in religious life and leadership is expanded (another concern that is reflected in the teachings and life of Jesus). A balanced and fair analysis might well reveal that today's forms of Judaism more closely reflect the teachings and life of Jesus than many expressions of Christianity today. Today, various expressions of Christianity adhere to some teachings and practices that would be an offense to Jesus and his followers. In some cases it may very well be that Christianity's adoption of pagan, non-Biblical, and non-Jewish customs and traditions has made Christianity (and subsequently Jesus) an offense to the Jewish community. For this reason, the idea of conversion to some forms of Christianity is not a matter of theological debate or spiritual enlightenment, but an impossibility for someone who has sworn to walk in the ways of God as outlined in the Old Testament, as upheld in the lives of Biblical spiritual leaders, and as expressed the teachings and life of Jesus. Sadly, the teachings and life of some Christians (past and present) are contrary to Jewish thought, Biblical teaching, and even contrary to the life and teachings of Jesus. For this reason, Jewish people have rejected Christianity. It is fair to ask, why should Jews convert from the faith that Jesus lived, to another faith? Answer: "You ask a wonderful question. In fact, it is often shocking to Christian groups to play out the full implications of this statement. They know that Jesus was Jewish... but play it out... this means that the religion that Jesus practiced... was Judaism. That, in fact, he did not eat shrimp. That he had a bar mitzvah (well, or he would have, had the ceremony been invented by then, which it was not). That he, ahem, didn't celebrate Christmas (except maybe as his birthday). Christianity, then, is NOT the religion OF Jesus (as so many Christians think it to be) but the religion ABOUT Jesus, which is an entirely different matter. The real historical answer to your question is that the very early Christians were Jews who followed this man as a teacher, but who later focused more and more on the man over even the message. With Paul ... the new group was transformed from people who still tried to use the Torah as a way of life, to those who viewed the "Old Testament" only as a book of predictions for the coming of the Messiah. And that break, and the fact that Christians concentrated so much on the messenger as well as the message, is really how a Jewish teacher wound up as the founder of another faith." - Rabbi Michael (last name withheld for privacy). In 1993, the pope presided over the establishment of diplomatic relations between the Vatican and Israel. On 30 June 1999, prior to his visit to the Holy Land, the Pope publicly stated his positive views regarding Judaism. The papal letter also included the Pope's intention to precede his visit to the Holy Land with a pilgrimage to Ur, the birthplace of Abraham who, as the Pope put it, "is our father in faith par excellence." The Pontiff also wrote that "while this focus on the Holy Land expresses the Christian duty to remember, it also seeks to honor the deep bond which Christians continue to have with the Jewish people from whom Christ came..." and that "The Jubilee must be another opportunity to deepen the sense of bonds that unite us..." Regarding the Jewish heritage of Christianity, the Pope stated, "The Church cannot forget her roots. Indeed, she must return to them again and again if she is to remain completely faithful to God's plan." (June 30 1999) We want to thank the Pope for his enthusiastic support of Judaism and the Jewish people. Visitor Comment: "CNN recently featured a special called "What Would Jesus Really Do?" On the show, they had a Rabbi talking about the real Jesus. The show also described Jesus as someone who would take an active roll in addressing today's social problems. Please comment." Jesus for Judaism Response: "Central to Judaism is the theme of Tikkun Olam, repairing the world. This seemed to be an important part of the message that Jesus preached and lived. So, it is very likely that Jesus would be concerned about issues like war and poverty." 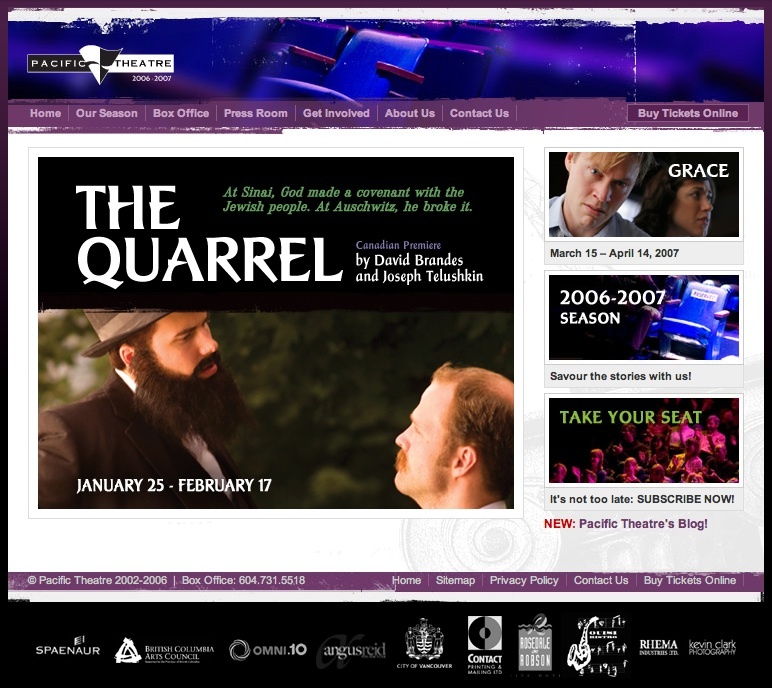 Visitor Comment: "I just found out that The Pacific Theatre in Vancouver, a Christian Theatre, is featuring the play 'The Quarrel' which is a thoroughly Jewish play with no reference to Christianity at all. Why would Christians be promoting Jewish plays instead of Christian plays? What's going on?" Jesus for Judaism Response: "Yes, we're familiar with this. The play is running from January 25 to Feruary 17, 2007. Judaism and the Jewish experience are becoming increasingly manifested in the lives of Christians who are feeling drawn to experience and express their Jewish heritage which is central to the message of their Jesus. You can click here to visit the website of The Pacific Theatre or click here to learn more about the movie version of The Quarrel." Visitor Comment: "There is a Jewish organization called the Tikkun Community who recently had the statement 'Jesus the Jew' on the cover of their magazine. Are Jewish organizations reclaiming Jesus after so many years? Is this kind of like Joseph reconciling with his brothers after many years of separation? What's up with this? Will Jesus eventually leave the company of the Gentiles and return to the community of Jewish thought and expression?" Jesus for Judaism Response: "It seems that Jewish organizations are increasingly willing to publicly profess the Jewishness of Jesus. This is awkward because of the Christian Church's history of persecuting Jews for many years. Yet, forgiveness and reconciliation have made this increasingly possible." Jesus for Judaism Response: "We're familiar with this documentary. The segment of the show you are probably referring to is about 36 minutes into the show where Sherri Summitt (a member of the Second Baptist church) states about Jesus, 'He was Jewish, he wasn't black nor was he white. He was Jewish, but that has no bearing on about how I feel about Jesus.' Sherri's statement was immediately followed by a comment from Randall Bailey (of the Interdenominational Theological Center) about what happened historically when people realized that Jesus was Jewish, 'The second thing that happened was that Caucasian people in Germany and France and the Scandinavian countries became Jewish -converted to Judaism.' Realizations like this are increasingly becoming mainstream." Jesus for Judaism Response: "Yes, we are aware of this news story. If you search on the Internet for similar stories you will find thousands of other incidents where such events are occurring. Christians are becoming more and more aware of the Jewish roots and they are desiring to learn about and support Judaism. Often these circumstances arise when Jewish congregations are without their Synagogue or Temple due to building expansion projects accommodating the rapid growth of Jewish congregations in the United States." Jesus for Judaism Response: The report you heard is being aired on Christian radio stations. It is produced by the Israel Ministry of Tourism. Because Jesus was a devout Jew, it is possible that he would have respected the Biblical command to bind the words of God to the forehead and hands. He went so far as to criticize some of the Pharisees for not living a life expressive of the practice. We have not yet determined why Christian radio stations are now broadcasting Jewish teachings from Israel promoting the Jewish faith of Jesus. The following news story, while based mostly on true events and facts, is fictitious. It presents the above points from a humorous perspective. RLI NEWS - Jerusalem, Israel. Is the Pope Catholic? Maybe Not! Recent Biblical and archaeological evidence now confirms that Jesus was, in fact, Jewish. For approximately 2000 years, followers of this first century Rabbi were apparently unaware that their leader was Jewish. This amazing discovery was made by Dr. Hadassah Hillel of the Zion Historical Research Institute. When asked about the discovery, Dr. Hillel explained, "It wasn't that difficult to figure out. Both his parents were Jewish going back many generations. He grew up in a Jewish community, and after he was of age, he continued to attend Synagogue and pursue Judaism as an adult. So, he was not only Jewish by birth, but someone who chose Judaism as a way of life. It's hard to believe nobody noticed this until now." Is the Pope Catholic? Maybe not! Apparently the Vatican was aware that Jesus was Jewish, but did not make the information public. This would explain why the Pope and other Catholic leaders wear a Yarmulke (Jewish head covering) as seen in the photos below. Representatives of various Protestant and Catholic organizations have now made official statements apologizing for the oversight. Jews who were in the process of converting to Christianity are being told to return to Synagogue, while many devout Christians are now in the process of converting to Judaism out of respect for their Jewish leader. "It's all very confusing," exclaimed one Baptist minister. Rabbi Ariel Cohen has seen his congregation increase dramatically, "It's really quite amazing. Jews who had left Synagogue to join churches are returning to Synagogue and bringing their Christian friends with them." A professor of Hebrew at a local university commented, "Part of my rejection of Jesus at any level was because he didn't seem to do much for Judaism or Jewish community. Historically his followers have been indifferent or even hostile toward Judaism. That's not a very good track record for someone who wants to be the Messiah of the Jewish people. It will be interesting to see what develops in light of this recent discovery." The North American based organization Jesus for Judaism was also instrumental in this discovery.